Getting a new mattress can be an exciting time. Maybe you’re upgrading your mattress to one that’s more comfortable and bigger. Or maybe you’re moving in with that special someone. Either way, before you can buy a new mattress, you need to figure out what you’re going to do with your old one. Luckily, we did all the homework for you. That’s right. We’re going to show you step by step how to clean and store a mattress, box spring, and bed frame. Because if you value your space, and don’t want to deal with selling your old mattress on Craigslist, you know that keeping it around is not an option. Disassemble your bed frame and headboard before cleaning them. Before you clean your mattress, box spring, and bed frame, we recommend taking apart the bed frame and headboard. After you’re done, put all the screws, nuts, washers, and other small pieces in a Ziploc bag. Then, tape the bag to your headboard. That way, all the pieces are in one place, which makes moving, storing, and re-assembling your bed frame much easier. Pro Tip: Don’t forget to wash your bedding. Especially if you’re going to use it on your new mattress or put them in storage. Easily clean your mattress, box spring, and bed frame using things you already have at home. How the heck do I clean a mattress? It’s pretty simple actually. 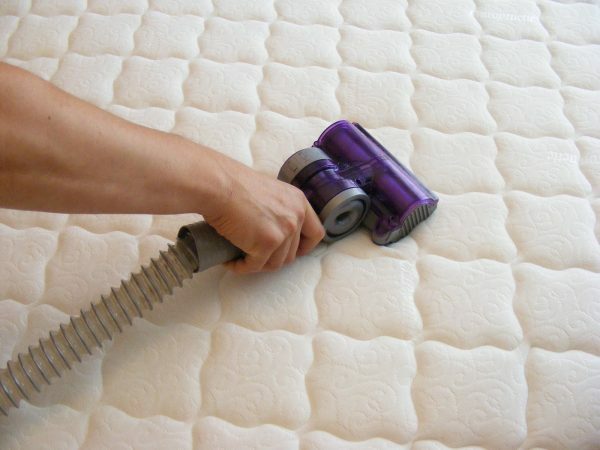 Grab your vacuum and use the brushy nozzle to vacuum all the dust, crumbs, and dead skin that’s settled into the mattress. Next, use an upholstery cleaner like Bissell’s Pet Stain Pretreat for Carpet & Upholstery (recommended by Good Housekeeping) to remove stains and obliterate odors. Just make sure to do this in a well-ventilated area and let your mattress air out before you put it in storage. Prefer to go a more natural route? Add a few drops of your favorite essential oil to a container of baking soda and sprinkle it on top of your mattress. Give it a good massage, leave it there for an hour, and then vacuum it off. Free Bonus: Want more easy cleaning hacks like the one above? Check out our list of 5 insanely easy cleaning hacks that are ridiculously effective. Though your box spring gets much less direct use than your mattress, you should still vacuum it like you did with your mattress. 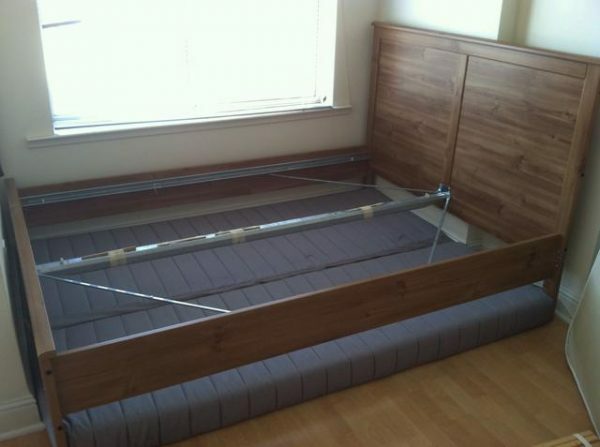 Oh, and don’t forget the bed frame. Mix some water with dishwashing liquid, dip a rag into the solution, and then wipe your bed frame with it. Protect your mattress, box spring, and bed frame before moving it. Now that you’ve cleaned your mattress, box spring, and bed frame, the last thing you want to do is to get anything dirty or scuffed up while in transit. 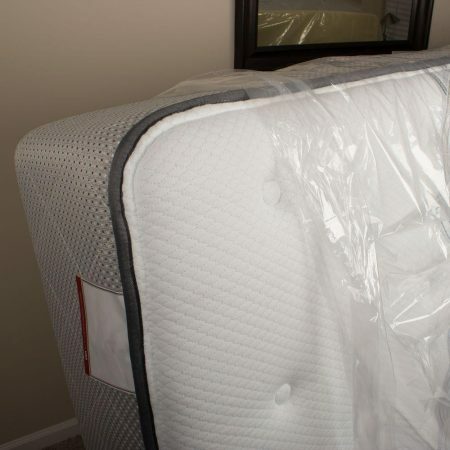 Put your mattress and box spring in separate mattress bags to protect them against dust, dirt, stains, water, and damage while they’re in transit or storage. To protect your now-disassembled bed frame, wrap the pieces in moving blankets. Lift and carry your mattress without breaking a sweat. If you’re the Hulk, skip to the next section. If you’re not the Hulk, skip nothing because you’re going to need help from a friend. And moving straps like Forearm Forklift’s Mattress Mover straps so the both of you can easily lift your mattress, carry it downstairs, and load it into a moving or rental truck without breaking your backs. Why the emphasis on “moving or rental truck”? Because tying a mattress to the top of your car is dangerous (Who wants to crash into a flying mattress? Oh right, no one), and you run the risk of bending your mattress beyond repair. Put your mattress, box spring, and bed frame in storage. Haul everything to a storage unit. Pack everything into a storage unit. Make sure your mattress lies flat (so the padding and coils don’t settle). Return your rental or moving truck. And then treat your friend to dinner as a “thank you” for taking time out of his/her weekend to help you. Right? Wrong. We had you for a minute. This is the MakeSpace blog. And with MakeSpace, you haul nothing. You lift nothing. You pack nothing into a storage unit. You rent no truck. And you treat no one (although we do like food). Wrap your items in their appropriate covering. Relax. We’ll take care of the rest. We’ll pick up everything, store it in our secure and temperature-regulated storage facility, and create an online photo catalog so you never forget that you stored a full size mattress, not a twin. When you need your old mattress and bed set back, you can just log into your MakeSpace account, click the items’ photos, and we’ll deliver everything to you. Which gives you more free time to do whatever you want, like anything but visit a self-storage unit.